Because of Jesus Ministries – Grace for everyday life. 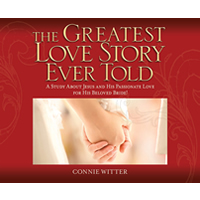 Connie Witter teaches from the Song of Songs book of the Bible. In The Greatest Love Story Ever Told, we learn about the ageless, timeless, love affair Jesus invites us into. He is hopelessly in love with you. You take His breath away. His is the only love that will satisfy the longing of your heart. Listen as Connie describes this incredible love He has for you and how it will change your life. Let your heart soar as you listen and understand how dearly loved and cherished you are by the King of Kings, Jesus! His words of love and devotion will penetrate to the deepest parts of your heart as you open up to Him in ways you have never dreamed possible. This ancient book of the Bible is Jesus personal love song to you and it gives Him great joy to sing it over you, His Beloved Bride. As you bask in the song's beautiful lyrics, you'll discover the Jesus one desire is to win your heart and set you free from your fears and insecurities with His perfect love. Watch your own story played out in the beautiful book, and see that the True Gospel is "The Greatest Love Story Ever Told!"